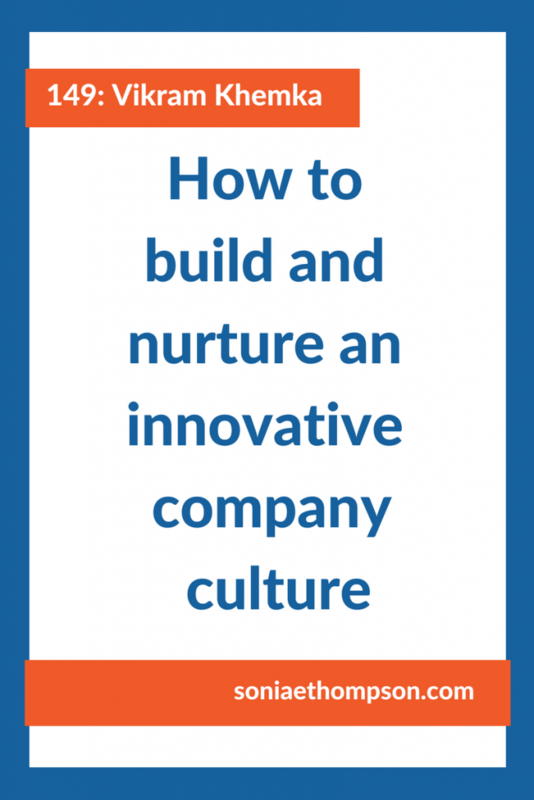 Today we are talking about innovation, and specifically how to build a company culture where innovation thrives. And to dive into this topic, I chatted with Vikram Khemka, Director of Technology at Cimpress, a multi-billion dollar mass customization business. You’ve probably heard of one of their core brands: Vistaprint. We can learn a ton from Vikram, including the link between an innovative culture and your company’s talent. Sonia Thompson: Hello Vikram, thank you so much for joining me today. How are you? Vikram Khemka: I’m very good. Thank you for having me. Sonia: Oh, it’s my pleasure. All right, well let’s go ahead and dive right in. Tell me about your company Cimpress. Vikram: All right. So, Cimpress is the world leader in mass customization. We own many different brands and companies that all work in the mass customization space. Vistaprint is our biggest company that people might have heard of, but we have many, many others spread all over the world. In Europe, and in Japan, China, India, Brazil, really a very global company. We are all about mass customization. So, what does mass customization mean? It’s really all around us, even if you don’t really recognize it. So, if you are a small business, and you are trying to promote your business, and you want business cards, that’s part of mass customization. If you are a small business and you are having an event and you want themed T-shirts, that’s mass customization. If you are say, a small hotel chain, or even a big hotel chain and you have these laser engraved pens, of any kind of customized pens with your logo on it, that’s mass customization also. So, we essentially lead the mass customization industry, and we do that because of the investment that we have made in technology. And refusing to accept the status quo in terms of, this is the manual process, and this is how it’s done traditionally, so this is how we should do it as well. Sonia: Got it. You said so many wonderful things there, and I really like how you kind of just sort of demystified mass customization, because we all use it so frequently as part of our day to day. So, let’s just kind of wrap this part up with a little bow. You said it, but I just want to clarify, what is the specific problem that you solve for the people that you serve with your mass customization brands? Vikram: Mass customization … customization is expensive, and if you are trying to do that at scale, it gets even more expensive. And especially if you are a small business, which happens to be the target audience of many of our companies, not all of them. But even if you are a mid-sized company, getting customized goods produced for you is really expensive and time consuming. And what Cimpress does is, it makes it through the many brands that we own, a lot easier for people who are in the market for customized goods. Starting from micro businesses, which is what Vistaprint focuses on, to more bigger businesses, that another company that we own called National Pen, is on. Across the spectrum, make the process and the experience of getting customized goods for your personal use or for your business, a lot easier. Sonia: Okay. No, I like that, I like that. Vikram: Or give you enterprise that you are going to be happy with. Sonia: You mentioned that mass customization can be expensive, and you guys have invested a lot in being able to do it in a cost effective way. What would you say is a role of mass customization, or customization period, in delivering remarkable experiences to your customers? Vikram: It’s all about brand identity, the way I look at it. So, if you are a small business and you want to … or even a medium sized business, you don’t want to just give away a pen or a T-shirt, you want to give away something, or have your team even, use something that has your brand identity on it. Or if you’re running an event and you want some flyers to advertise your services, or you want a business card, you obviously want that customized, right? You want it to be with your name on it, your company’s logo on it, your company’s color scheme on it. So, it’s really about something that people identify with. It’s about what businesses identify with. And it could also be about what a consumer, or our personal use customers identify with. Sonia: Okay. Okay. Now, I know your company has a lot of fantastic capabilities in being able to do this on a really massive scale. Is customization something that a business is only really able to do if they invest these types of significant resources, or is that why they should come to you for that kind of help? Vikram: If you’re a business, you’re obviously not going to … Say, you are an accountant, or you run a small tax consultancy firm. You need business cards, or you need to advertise, or you need a website, or you want team T-shirts or polos, or whatever. You’re obviously not going to do that on your own, you’re going to outsource that or buy it from someone, whether it be your local neighborhood store, where you can go and physically spend time with them, explain to them what you are looking for, and then get something back in return. Or whenever you order it, with typically fairly long lead times. Or you can do what many people around the world do, go to one of Cimpress’s brands, and are able to have that same transaction entirely online. If they need support, we are able to provide human support as well. But for the most part, the whole process is a lot easier. Our lead times are typically much shorter than what you would get on the open market. Our pricing is a lot more attractive. We offer quality in a very wide spectrum. You know, for the more quality conscious customers, we offer much higher quality products. For someone who’s looking more for a budget offering, we offer that as well. So, it’s really about making that experience a lot easier and smoother. Sonia: Yeah. And I like … I mean, what business doesn’t need the processes to be easier, and smoother. And I like that that’s a service and value that you provide there. Now, as we’re thinking about other businesses who are considering doing customization, not necessarily in the realm of what you’re doing in terms of gifts and brand identity, but they’re just thinking of ways to customize for their customers. That is something that you guys have been able to see lots of great benefits from. Being able to give your customers something that’s exactly what they need, and it’s not necessarily just off the shelf. Vikram: Yeah. Absolutely. I do believe that it’s not just about the ability to produce customized goods. It’s also a lot about the experience around that, which is, can you give them meaningful recommendations about what else they might be interested in? Can you give them meaningful help and recommendations about how to make their design look better? So, obviously the turnaround time, the cost, the quality, those are all the base things that you would think of in purchasing anything. But I think the real value add comes from the overall experience. Like, did you make meaningful recommendations? Did you make the design process easier? If you are not a professional designer, then were you still able to get a product that you are happy with, with some of the tooling that we might provide directly in the browser? On the other hand, what a lot of our … so, this is what Vistaprint does extremely well, they target the do-it-yourselfers who are not professional graphic artists. Many of our other businesses actually go after their target customers are the graphic artists, who already have a design and artwork. But what they’re really looking for is ease of ordering, and ease of getting their design on to a physical product. So, it’s not just about the fact that you bought a few presses or some equipment, and now you’re good at mass customization. I think it’s really about the overall customer experience. Sonia: For sure. For sure. How does innovation help companies deliver remarkable experiences? ‘Cause I believe innovation is a big part of the customization process, but it’s been a big sort to lever to the success of your company. So, how does that play in? Vikram: I guess it goes back to what I said at the very beginning, about refusing to accept the status quo, refusing to believe that just because some industry has been doing this, something in a certain way for decades, that’s how we will do it as well. So, we are always looking for better ways of solving our customer’s problems. Oftentimes, problems that our customers don’t even know that they have. So, I’ll give you an example that we recently rolled out, and was built by my team. It’s a service called Crispify. And what that does is, if you have an image that’s not very high quality, like it’s a low resolution image, the details are blurry, it obviously will not print well. And one of the challenges is that even though it might look reasonable on screen, on a physical product, when it’s ink on paper, it’s not really going to look good. So, from our perspective it actually was a double whammy, because the customer thinks that they’ve got something fairly reasonable on screen. But when they get the physical product in hand, they’re really disappointed. Typically the way people handle this is by just giving their customers a warning that, “Hey, your image is just low quality. Could you give us a better image?” And that’s what we did for a long time as well. But what we did recently is leveraged machine learning to create something that on the fly can double the resolution of your image, and still provide an output that will be appealing and acceptable to a human. Like, doubling the resolution just artificially, that’s not difficult. The trick is, or the challenge is, to do it in a way that appeals to the human eye. Vikram: We were able to do that after a lot of research and not accepting the status quo, that this is a problem that’s too difficult to solve. And that was core innovation that we did, core research that we did, that now leads to a much, much better customer experience. And as you would expect, the results are astounding. We’ve seen about a two and a half, three percent increase in conversion rate. As a result of that, our customers are happier, and we are happier. So, this is obviously one of the areas where we innovated, and pushed the boundaries of what was considered too difficult to solve. Sonia: I think that that is a fantastic innovation, and I think it’s an even better innovation that shows how you can improve the customer experience. But it only comes from really understanding the customer, and every aspect of their journey. I’ve been on the receiving end of, “Oh, your image needs to be better,” or whatever, and it’s just frustrating ’cause I would have said, “Well, hey, if I had a better image, I would have uploaded it.” So, it’s one of those things where you’re anticipating a problem and fixing it. And I think that is brilliant. Now, to get to a place to where you’re able to provide innovative solutions, like you said, you have to have a culture that isn’t willing to accept the status quo. How do you create that culture that is really unsatisfied with what the norm is, and that is relentless about finding new and innovative solutions to better serve your customers? Vikram: I think it really starts at the top. And this is where I think Robert Keane, our CEO … when he started Vistaprint in the mid 90s, or late 90s, whenever that was, which then evolved into Cimpress, I think one of the things that he did really, really well and realized early on, was that technology and innovation has a really, really important role to play. So, I remember when I first started at Vistaprint, Vistaprint was still very small but already a public company. This is probably back in 2006. And I remember thinking to myself at that point, “What am I going to be doing in a printing company?” I’ve got all my education in computer science, I have worked on Wall Street, what am I going to do at a printing company? It took a lot of convincing at the time for the people who hired me. But I think that goes to show, the fact that from the top, the company always believed in innovation and in hiring really smart people to solve problems that were considered too complex. And I think it’s something that for the most part, even as we have grown many fold since 2006, we’ve been able to retain that culture of treating, or thinking of technology as one of the pillars of our business. It’s not something that is an after thought, or something that oh, you just need to run your business. It’s what our business actually runs on, or drives our business. In our business I believe it’s technology, marketing, and manufacturing that all really need to play hand in hand and be effective partners for us to be successful. But I think the key is for a company like us, to be in what was, and continues to be … traditionally was and continues to be a really manual intensive process, to challenge that and say that it does not have to be that way. Technology has a role to play here. All the way from machine learning, to having extremely great UX on a website, to having sophisticated fraud a lot of times. It’s really about e-commerce in a space that has not really been there. Sonia: Got it. So, it sounds like you all work to keep that sort of innovative mindset, it begins at your hiring process. With making sure that you’re able to bring people on who have this sort of point of view and innovative thinking. Are there other things that you guys do on a day to day basis, just to keep people … Just to make sure nobody gets complacent, and nobody gets complacent with … it’s just easier to do it the way that things have always been done. So, how do you make sure that people keep that fire going? Vikram: I think we are very data driven, and that really helps. I think we strike the right balance between research for innovation and research for the long term, versus what’s driving somewhat immediate business value. So, giving another example from my team. Cimpress has a fairly large embroidery business. And embroidery is extremely, extremely complex. Say you have the letter A that you want to embroider, the embroidery machine just understands … it’s really, really dumb, and all it knows is you tell it go from this point to that point, make a stitch at this angle, and then go from that point to this other point, and make a stitch at whatever other angle, and so forth. So, depending on how thick your letter is, and whatever, there is essentially infinite ways of filling it up with stitches. But there’s only going to be a few that actually appeal to the human eye, and that make sense. So, when we started the embroidery business, much like everybody else, we were doing it fairly manually. As our business grew, we collected the data and we tried to make as many improvements in process as we could. We tried to add technology as much as we could, to bring the time that we were spending on getting an embroidery order ready for production, as little as possible while maintaining quality. And so what we’ve done is, we’ve leveraged machine learning to now be able to predict when a new image comes in that we have not seen. Patterns for embroidery digitalization and stitches, that in the best case scenario, are exactly ready, or just going through automation, are ready for production. And the expected scenario is, it may not be fully ready for production just yet, but a human being just needs to tweak it a little bit. And maybe spend a few minutes, as opposed to the industry average, which is between 30 and 35, 40 minutes. So, that is a huge, huge change in terms of the impact that it can have on the industry, and the competitive edge that it can give to Cimpress. Here is the industry spending 30 minutes on something, and we can do the same thing in five or ten, or even lesser than that. So, it’s really about data. It’s about keeping abreast of what’s going on in the technology world, and trying to figure out how that can apply to our space. Sonia: Got it. And what would you say have been some of the biggest challenges, ’cause there’s definitely a lot of upside to this kind of innovation. But I think that sometimes companies get hung up on innovation as a culture, because of some of the challenges that it brings. So, what would you say have been some of those that you’ve experienced, and how do you guys work to overcome those challenges? Vikram: I think that some of the biggest challenges are that investing in research and innovation, and it is expensive. And if it doesn’t yield results at the end of the day when you’re running a business, you’re going to have to sometimes make difficult decisions about how much can I continue to invest in this, versus just run the business and make money. And I think that’s a challenge. I’m not saying that we’ve gotten it right all the time. I don’t think that that’s possible. But it’s, I think, about striking the right balance and not becoming too anxious because you had some failures. I think failures are part of the learning journey, and I don’t think that anything is … usually things are not a complete failure. Even if you didn’t meet your business goals, you learned something from that, and maybe you can apply that in some other aspect of the business. So, I think it’s about judicious risk taking, and continuing to believe and accept that some amount of failures will happen, and that’s just part of the deal when you have an innovative culture. Sonia: For sure. For sure. All right, so one of the principles of your company is that it’s all about physical, more personal connections. Can you explain more about this philosophy, and how your team brings this mantra to life? Vikram: In the context of what my team does, what we do is we provide software and services to many of the brands that Cimpress owns. My team does not directly talk to, for the most part, the end customers who are actually buying products from one of our brands. But what I would like to talk about is, that mantra applies across the board, not just with end customers. If my customers are colleagues who happen to be working in one of the other companies that Cimpress owns, how do we make a personal connect with them? And I think the biggest challenge over there is to A, not make assumptions. And then, if you do make assumptions, challenge your assumptions, and understand the business. For someone like me, who started with Cimpress when it was Vistaprint, and it was just Vistaprint, and Vistaprint has a very specific way of doing business. They target a specific kind of customer. And having seen the explosive growth from Vistaprint, it’s very easy for someone like me to just think of everything with the Vistaprint lens on. Now, the Cimpress of today is very different from the Vistaprint of 2006, when I started. Many of the other companies that we have are completely different from Vistaprint, even though they are in the mass customization space. So, making the effort to go out to our colleagues, and those other businesses, actually visiting them, partnering with them, collaborating with them, and understanding what business problems they are trying to solve, versus trying to sell them a solution that we built for Vistaprint, which may or may not be the right thing for them. And having that constant flow of ideas back and forth, having that dialogue, and having it be two way. All right, I’m going to try and understand your business problem, and the specific kind of customer that you are trying to reach. But at the same time, let me try and explain to you what I’ve learned from working with another businesses. And I think that two way communication and that dialogue, that’s really key for that portion of connect. Building that relationship and building trust, I think is extremely, extremely important. Sonia: For sure. For sure. Now, I know one of the the things that Cimpress prides itself on is maintaining an entrepreneurial culture. And that’s something that most start ups have in the very early stages, but as they start to grow bigger, it becomes more and more difficult to do. How have you all been able to maintain that type of entrepreneurial culture as you’ve grown bigger, even with multiple businesses? Vikram: You’re right. I think the biggest thing that we’ve done is, we’ve decentralized. So, all of our brands run independently. There’s very few central teams within Cimpress. And even those teams, the central teams within Cimpress, one of which I am part of, run very small and lean teams. Even though as a group Cimpress technology, the central team that I am part of, is a whatever, 200, 300 people, we run in very, very small teams. So, I lead a team who’s total size is maybe 25, 30. But even within those teams, each of our squad, as we call it, which is sort of the smallest building block, is usually no more than five or seven people. So, because we have small teams and we try to reduce our coupling and dependency on each other, small teams I believe, tend to be much more nimble and agile, because there isn’t that much process for them to change, and they don’t have that many dependencies. So, keeping the size of our teams small, and keeping our teams focused in a specific area of the business, I believe harbors innovation and the entrepreneurial spirit of being willing to try different things out really quickly. And that, I think, becomes much harder as you have larger teams, because something that you try has a potential to impact many more people, in terms of bodes well and adversely, and to stop the process. Smaller teams tend to be much more nimble. Sonia: For sure. For sure. This has been fantastic. Where can people find you, or find more about Cimpress and the work that you guys are doing, if they want to learn more? Vikram: Obviously, we have our website. From the work that Cimpress technology is doing, a lot of our APIs are actually publicly available. We have a portal called developer.cimpress.io. So, a lot of the technology work that we are doing is available there for people to look at. We do believe very much in open source. So, we contribute to the open source community, but also whenever it makes sense, we heavily leverage code that has been open sourced by others. Sonia: Cool. All right. Any parting words of wisdom for business leaders who want to build an innovative company culture, as a means to deliver remarkable experiences for their customers? Vikram: It’s going to be sound like a broken record, but refuse to accept the status quo. Like, think about the problem that you have in front of you and don’t get bogged down by this is how it’s done. Just because this is how it’s done today, or most of the industry is doing it in a certain way, doesn’t mean that you have to do it the same way. And I think to enable that, you really need to have a group of people who share that passion and that attitude of challenging that, and trying to come up with better solutions. It doesn’t have to be perfect. I think that’s one of the other things that we do very well. In my space, we don’t try to automate everything. Well, we do try to automate everything, but we are not dogmatic about it. If we get to a point where we realize this is as far as automation can go, but it will not yield a result that our customer is going to be happy with, we are okay with having manual intervention to delight our customers. As long as we are being extremely selective and conscious about why we are doing the manual process, and how can we make the manual process itself the most efficient it can be? So, it’s really about, I think, being customer focused, and refusing to accept the status quo. Sonia: Love it. Love it. Again, thank you so much for stopping by. This has been super insightful, and I really enjoyed the discussion. Vikram: Thank you very much, likewise.